Confession time: I get really bummed out every year when Easter rolls around. While I’m not religious (raised to be, ‘fell away,’ if you will), I do miss the traditions my mother worked hard to create. Easter breads with chocolate or fruit (chocolate all the way, baby), dresses (I wanted so badly to wear a hat every year, but as soon as I’d put one on I’d have to rip it off–so not comfy), all the windows open, the cats diving into fake plastic grass in the Easter basket–what’s not to love? And I swear there wasn’t a single rainy Easter during my entire childhood. A miracle, no? But this Easter? It was cold. And rained all day. And I spent most of it in a bleary hangover. But the food, the food. Even though I was in a hungover daze this year–and even though it was disgustingly not spring-like–I did manage to throw together a feast for one (and a feast that will serve as lunch for the rest of the week–hooray! )–Indian style. These two curries are simple to make and time out perfectly together–just be sure to chop and measure out everything ahead of time so that you can throw each bit in at the correct moment. It’s hard to pick a favorite given how different they are from each other, but I must admit I fell head over heels for the collard green curry. 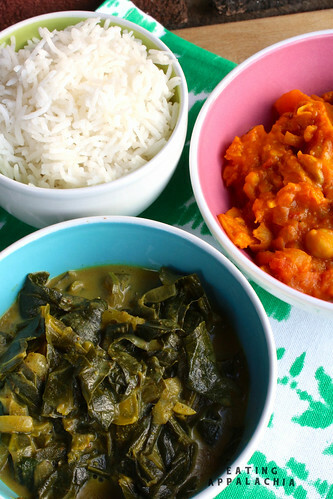 I’d never thought to prepare collard greens with Indian spices before, and those coupled with the coconut milk? Instant flavorful heaven. And butternuts and chickpeas are always a winning combination too, so it’s impossible to pick a loser. Just give in and make both and enjoy with some Basmati rice for your own Indian should-be-spring-but-feels-like-winter feast! Wash the greens thoroughly to remove all dirt. De-rib and chop into bite sized pieces. Set aside. Warm the oil over medium heat on the stove in a large dutch oven or stock pot. Add the onion and cook 5 minutes, until translucent and beginning to brown. Add the garlic, ginger, and jalapeño pepper. Cook 1 minute, until fragrant. Add the spices, cook 30 seconds, and add the coconut milk and water. Stir to combine. Add the collard greens, stir to coat, and place the lid on the pot. Let steam down, stirring periodically. Once the collards have steamed down into the liquid, lower the heat and simmer 30 minutes until cooked. Add salt to taste. In a pot/large sauce pan, warm the oil over medium heat. Add the onion and cook 5 minutes until translucent and beginning to brown. Add the garlic and ginger and cook 1 minute until fragrant. Add the spices, cook 30 seconds until fragrant. Deglaze with 1/4 of the water and add the butternut squash cubes. Cook 3-4 minutes until the butternuts begin to brown. Add the chickpeas, tomatoes, and remaining 3/4 cup of water. Bring to a boil, then lower to a simmer. Cook 20-30 minutes, until the squash is tender. Add the coconut milk and cook another 2-3 minutes, stirring constantly. Adjust salt to taste. I love that we both went non-traditional for Easter this year – and that we both went for the butternut! Funny enough, following my Mexican food bomb I’m totally craving Indian food now. Wish I could get collards in the UK… something to grow, maybe? oh, a woman after my own heart. as you know, i’m not a fan of easter, either, but i AM a huge fan of curry, especially when butternut squash is involved. looks delicious! YUM! I love Indian food for curing a hangover. These sound delicious! Easter is one of those holidays I tend to forget about completely until I realize the library is closed, at which point I get annoyed. But this year, coincidentally enough, we went to the Indian buffet to gorge on all the curries in the land! Next year you should totally plan a festive Easter brunch for all your other holiday orphan friends–or at least the ones who have family stuff planned for dinnertime. Orphan feasts always make our Thanksgivings much more bearable! Yum! the two dishes look like they go well together. I’m just starting to learn and cook more Indian dishes, love the curries! I would kill for those collard greens right about now. I know that everyone’s into the whole raw greens salad thing these days, but I love my collards cooked down, low and slow, until tender and buttery. These. Look. Heavenly.